Long designed with bland respectability in mind, banking institutions have rarely been places to find dazzling architecture and interior design. 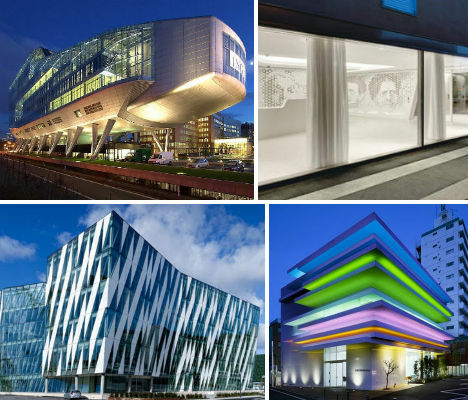 But if you think that’s still the case in the 21st century, you haven’t seen these 13 modern banks, built and unbuilt, from Morocco to Norway. Vivid colors, eye-catching details, the latest in green technology and a sense of accessibility make these bank designs fresh and up-to-date. 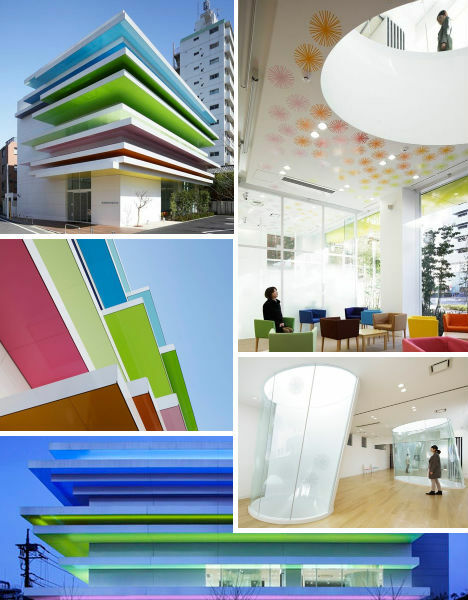 Banks aren’t exactly known for being cheerful, colorful places, but Emmanuelle Moureaux’s design for the Sugamo Shinkin in Tokyo turns the old stodgy stereotype on its head. Staggered horizontal layers of color, illuminated at night, brighten up the facade and the color scheme is continued in smaller doses inside. Three elliptical glass skylights, cut in through the second floor to the lobby, let in lots of natural daylight and also provide fresh air. You could be forgiven if you walked into the Raiffeisen Bank in Zurich and did a double take, wondering whether you accidentally wandered into a high-end retail store. Minimalist white surfaces, curving forms, mirror ball lighting and perforated images of historical residents from the local area characterize this unusual interior space, designed by NAU cooperative. 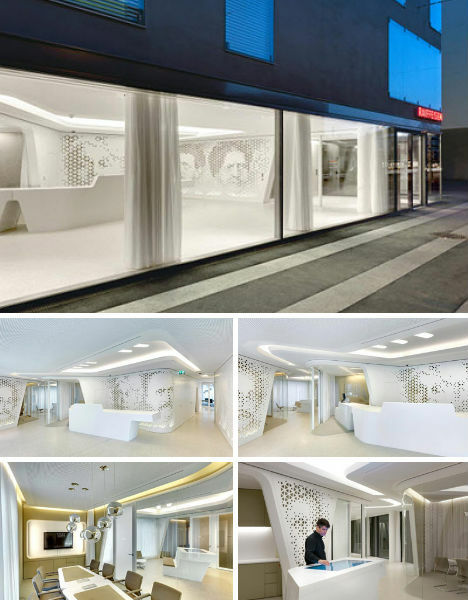 “Raiffeisen’s flagship branch on Zurich’s Kreuzplatz dissolves traditional barriers between customer and employee, creating a new type of ‘open bank’, a space of encounter,” say the designers. Foster + Partners reinterpreted elements of traditional Moroccan architecture to give the BMCE Bank flagship branches in Rabat and Casablanca a fresh yet grounded feel. 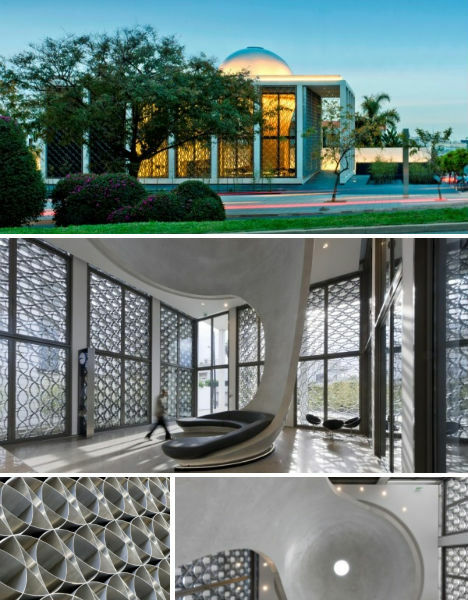 The first buildings by the firm to be completed in Africa, these banks feature bright, open interiors with stainless steel mesh screens in Islamic geometric patterns for security and shade. Each branch also has an ‘earth tube’: an electricity-free cooling system enabled by an empty pipe that encircles the building underground to draw in cool air from the earth. Dramatic skylit domes swooping down from the ceiling to join up with curving benches provide irresistible focal points. 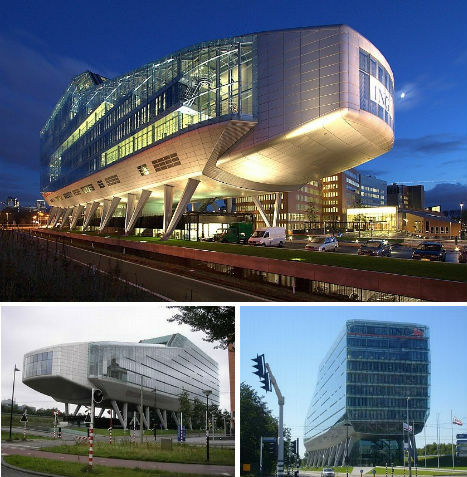 When viewing the ING House bank headquarters in Amsterdam, some people see a shoe shape as the architects intended while others imagine some sort of gigantic insect. But the unusual form of this building has made it a popular tourist stop and a favorite subject for architecture photographers. 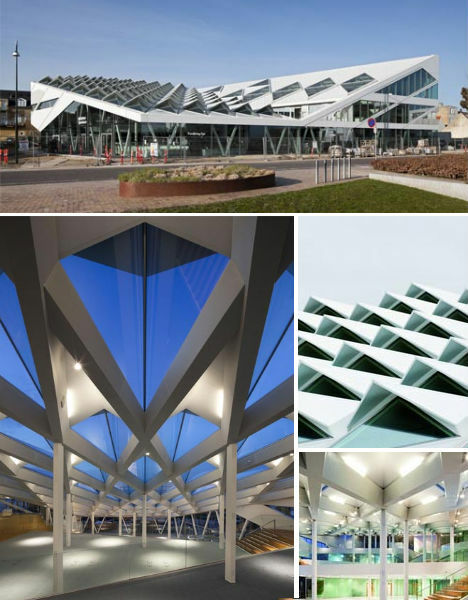 Meyer en van Schooten Architecten built the contoured anodized aluminum and glass structure on sixteen steel legs. Inside is a hall, an auditorium for 250, a lobby, a restaurant, meeting rooms and 160 parking spaces. 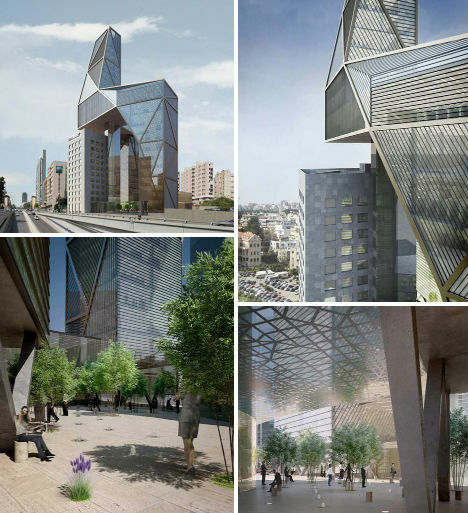 While the mock-ups look incredibly realistic, this redesign of the BLC bank headquarters in Beirut, Lebanon has not actually been built. 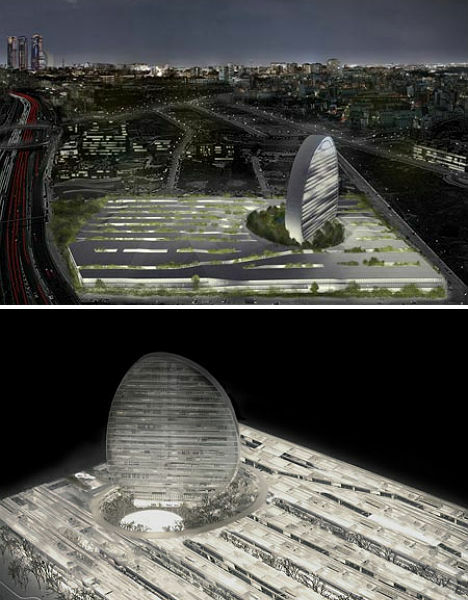 Architects Atelier Hapsitus submitted this proposal for a design competition and it was one of two finalists. The design remodels the old building and adds a faceted new tower that would connect with the existing one at ground level and cantilever over it at the top. This design preserves the views of the old structure, and also allows it to be removed at a later date. 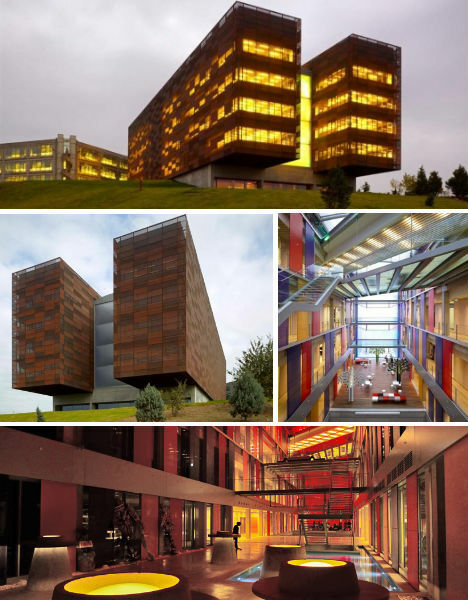 Turkey’s Yapi Kredi Bank comissioned this banking academy from TEGET Architectural Office, who delivered a pair of copper beams that extend horizontally from the existing complex. The design shakes up the scheme of cube-shaped structures at the bank’s headquarters, bringing in color, asymmetry and texture in the form of oxidized copper panels on the facade. The ‘void’ between the two beams is made primarily of glass with suspended platforms and stairs that are open to street level. Design firm MVRDV envisions a pixelated, amorphous headquarters building for DnB NOR in Oslo, puncuated by stepped negative space. Diaphanous and pale, the design seems to shimmer, with glass offering both views of the city from inside and a counterpoint to the stone skin which lends solidity to the structure. Construction is currently underway on the building which contains 2,000 flexible work spaces and a panoramic 140-seat meeting space on the top level. Low and angular with 83 prism-like skylights peeking up from its roof, the Middlefart Savings Bank headquarters in Fyn, Denmark reflects the shapes and colors of the ships and sailboats that it looks out upon in the harbor. The roofscape lets in light, defines the geometric design theme of the building and provides a view of the building while also shading the interior from harsh direct sunlight. 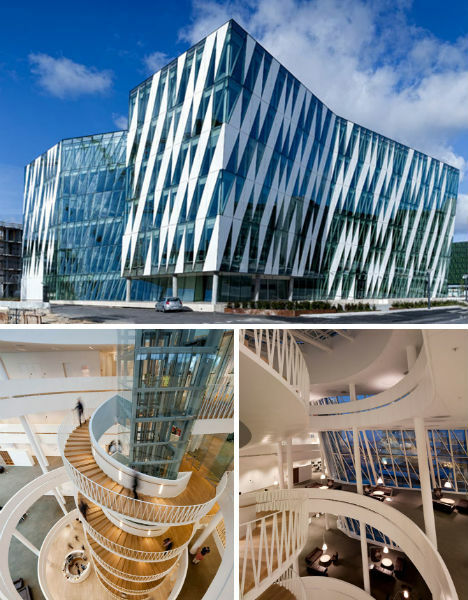 Danish architecture firm 3XN gave Saxo, a Denmark-based online bank, a stunning headquarters featuring a striped glass facade and a spiraling stairway that serves as the structure’s architectural heart. The end walls of the two blocks that make up the building face toward the canal. The interior is transparent and open with a glass-roofed atrium. Set for construction on the outskirts of Madrid, the BBVA headquarters will resemble a slice of a sphere set among a new block of offices, commercial buildings and residences. 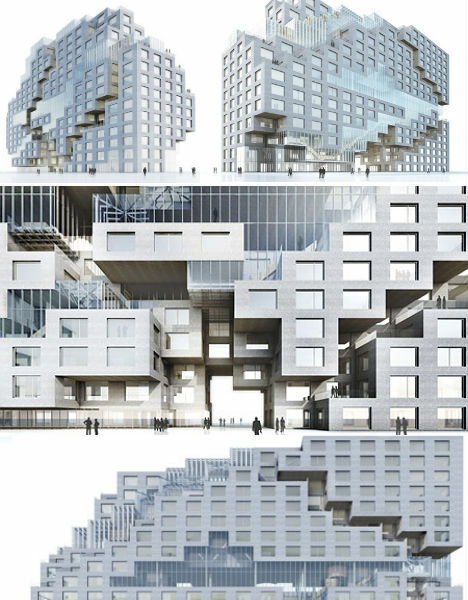 Architects Herzog & de Meuron plan to weave irrigated gardens and alleyways between the three-story buildings “like a carpet” to create a cool, moist microclimate, giving each workspace a “green view”. The disc-shaped tower is ‘cut out’ of the horizontal design, leaving behind an open plaza, and will contain offices with views of the city and the Sierra of Madrid. 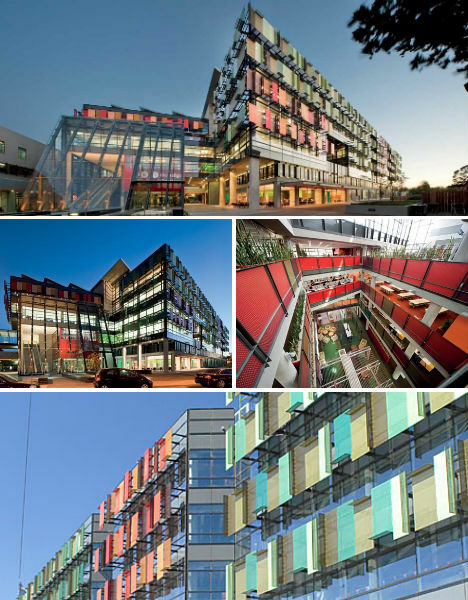 Bendigo Bank’s headquarters in Sydney, Australia juts out dramatically into the street, peppered with colorful performated aluminum sunscreens that give its facade a quirky and fun feel. The exterior of the building was designed by BVN Architects and Gray Puksand to respond to the individual orientation of each facade, and the colors incorporate both the reds of surrounding brick buildings and the greens of a nearby park. With an underfloor air conditioning system, a blackwater treating system and other environmental considerations, the building has been given a 5 star green rating. 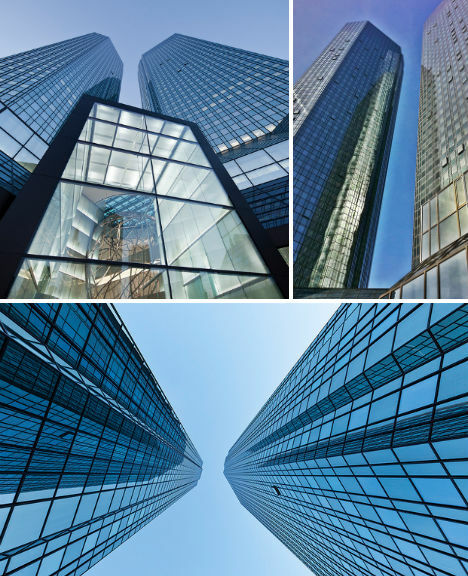 The twin towers of Deutsche Bank, which have become an iconic part of the Frankfurt skyline since they were first built in 1983, got a green renovation in recent years, transforming them with a new glass facade that glitters in the sunlight. The changes made to the building enabled the bank to cut down its energy use by half, reduce its water consumption by 70 percent and slash its CO2 emissions by nearly 90 percent. Is that a flying saucer? Perhaps the house from Sleeper got up and walked away in the middle of the night. 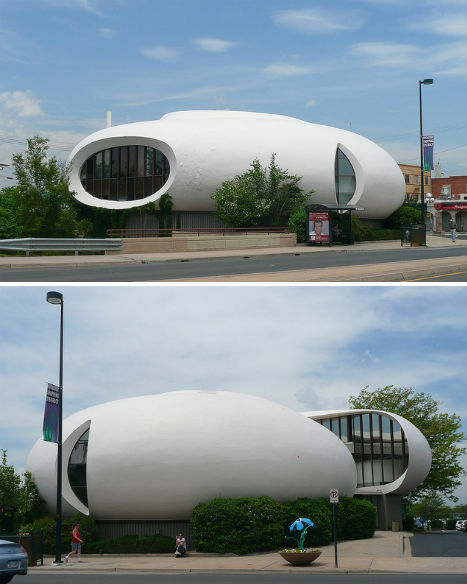 No, it’s the Bank of Choice headquarters in Englewood Colorado, designed by Charles Deaton in 1965. While far older than most of the buildings on this list, this structure still stands out as daringly modern when most banks have retained staid, institutional looks.